Picky eater. I’m one. I’m raising one. Really dislike the term. Can’t we come up with a better way to describe ourselves? I sometimes say “particular” or “quirky” as an alternative to the cliche “picky.” Any ideas, dear readers? 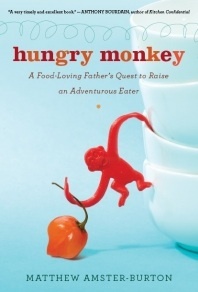 There’s a free, autographed copy of Hungry Monkey: A Food-Loving Father’s Quest to Raise an Adventurous Eater by Matthew Amster-Burton to the person who, in my humble opinion, comes up with the best alternative term for those who are, um, a tad fussy about what they’ll put on their fork. I can report that the book’s simple little recipe for cumin-ginger carrot coins is a big hit in my home (and prior to this dish my boy would only eat carrots RAW, like all his veggies.) I know, I should have such problems. Plus, the author is funny, about food, kids, and other stuff — including, well, picky eating. Find reviews on his virtual book tour. Send me your picky eater replacement phrase and I’ll pick a winner by 10 P.M. PST on Sunday August 9. There’s a post on the picky eater phenomenon pending — with insights you might find surprising. In the interim, read what my friend Paula Spencer says on the subject this week for Woman’s Day. Update: Wow! Thanks to all for chiming in — and for some terrific alternatives to the term “picky eater.” I may borrow some of these in my post on the subject. It was tough to choose just one but the autographed copy of Hungry Monkey goes to….Nancy for her choosy chow-hound suggestion. It’s witty, fun, and puts a positive spin on a challenging trait. Some may see it as an oxymoron, but those with choosy chow-hounds know that they can eat a lot — just not a lot of variety, or they’re particular about how the food is cooked, cut, or plated. Nancy: Send me your contact details and I’ll ship the book off to you. I’m heading out of town today, so if I don’t hear from you soonish I’ll post it when I return next week. My email is: sarahhenry0509@gmail.com. Thanks again for playing. And stay tuned for another cool food book giveaway in September. My husband is picky but he’ll tell you that he has “refined tastes”. My partner’s favorite: it’s tasteless so why bother! Growing up, we couldn’t say we didn’t like something. We had to take a “no thank you bite” to be polite. My parents would both shout at us as soon as they saw us make a face at something. Tastebud dysfunctional — my husband. We do not want to be a food snob, like Aunt Gretchen now, do we? Ha, to me that’s all it is. “Some things were just not meant to be eaten.” — Me as a kid. I want to say fuss-pot, but it’s so negatively slanted. Politically correct might be food challenge. My husband calls my daughter a picky princess. A moody foodie is what I say. My husband is picky, he doesn’t like everything, I do. Many picky eaters just don’t get it. They often miss out on important vitamins, nutrients, fibers…the list goes on.